A game that simulates life, or at least it would if your life was about being trapped on a sinking ship and forced to complete a series of incomprehensible puzzles before your practically inevitable death. As if that weren't enough to brighten your Monday, sticking your name down for a pre-order at Gamestop's website will nab you an exclusive Nine Hours, Nine Persons, Nine Doors digital watch. A replica of the 'bracelet' worn by the nine titular persons, the watch appears to feature a solid metal face until a button is pressed, revealing the time. If you're curious about Nine Hours, Nine Persons, Nine Doors, you might want to have a look at the interactive Flash demo on the game's official website in anticipation of the game's North American release on November 16th. Aksys Games, a publisher of interactive entertainment products, is proud to announce an exclusive GameStop online pre-order bonus for Nine Hours, Nine Persons, Nine Doors, the visual novel thriller for Nintendo DSTM. Customers who pre-order a copy of the game online at GameStop will receive the exclusive Nine Hours, Nine Persons, Nine Doors watch. The Nine Hours, Nine Persons, Nine Doors watch is a replica of the ”bracelet” worn by nine prisoners of the Nonary Game. 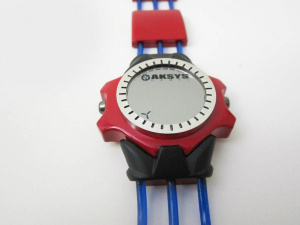 The watch is made of heavy-duty metal and resilient plastic tubing, with a screen that appears to be solid metal until the button is depressed, displaying the time in bright, red digits. “You too can sport the watch that the game revolves around, just like Junpei and his companions!”, says Frank ”Bo” deWindt II, Associate Producer, Aksys Games. Nine Hours, Nine Persons, Nine Doors will be released on November 16, 2010 for Nintendo DS. For more information or to find a store near you, log on to www.gamestop.com. Visit the official website at www.aksysgames.com/999. Cool....I guess. Just to let everyone know, I still go to this website but my computer wasn't working so I was on my DSi, which was too much of a trouble to sign in and post. Cool, its nice that there is more mature games on the DS, even though this is going to sell terribly because so. Really looking forward to this game! And the watch is pretty cool. If only I could get my hands on it. Strangely, the GameStop.com page for the game is worded to suggest that this is also available to in-store reservation customers. Then why all the hoo-hah about it being online exclusive? Nine Hours, Nine Persons, Nine Doors, No Funds. Just finished playing the demo, it seems like an interesting puzzle/mystery game. Feels like they took Ace Attorney and mixed it with SAW. Hell, I even excepted the villian to leave a videotape saying "live or die make your choice". What the hell? Why haven't I heard of such an awesome game and it's NA release coming soon? a watch? Hell I need new headphones and a watch so I guess preordering Super Scribblenauts and this would help me out! Intrigued by the game, but not the pre-order. I'll get it on my own time, as usual. Joking aside, I do actually need a watch, and this thing looks bulky, but casual-cool. @fishman--I looked on esrb.org, and its mostly rated M for "Strong Language", although it also has blood, violence, and drug/sexual references.